When celebrating the 112th Birth Anniversary on June 6 of Dr.N.M. Perera, one of the few great visionary statesmen produced by our country, one can only marvel at his commitment and his many predictions that have come to pass. When the “Pancha Maha Balawegaya” approached him to be their leader and become the PM, he refused stating that their Sinhala only policy would lead to racial conflict, bloodshed and division of the country. The 30-year LTTE war was the sad outcome, and it could have been prevented if Tamil was as also made an official language in 1956 as Dr. NM and the LSSP demanded. He also criticized the 1978 Constitution stating that the artificial grafting of the executive presidency would lead to perpetual conflict between the President and Parliament, headed by the Prime Minister, and the outcome would be worse if the two were from different political parties. Governance in Sri Lanka has broken down today under the UNP/SLFP Government as a result. His visionary policies targeted developing the national economy using modern technology, stressing import substitution, giving priority to self-sufficiency in food. He expanded the welfare state, taxing the rich instead of the poor. He increased the budget for science to 0.4% of GDP, the highest level in our history. He was able to increase FDI. He produced a surplus budget, lowered the level of both foreign and local debt while strengthening the foreign reserves. To cope with the triple global economic, fuel and food crises of 1973, while maintaining development, he called upon the nation to tighten its belt, with the affluent and the politicians giving the lead. His futuristic policies were dropped by UNP Governments after 1977 and with the present UNP Government’s Neoliberal policies the country is headed for disaster. The Government has increased the level of debt (which was 70% of GDP, under the Mahinda Rajapakse regime) to over 80% and is continuing to rise steeply. If these policies continue the inevitable result will be a “Greek tragedy”, which also was a consequence of its IMF loan. NM identified Imperialism as the main enemy confronting all developing countries, including Sri Lanka, where the UNP is its agent. He devoted his whole life to struggle against exploitation by global capital in the framework of a non-aligned (NAM) foreign policy. He was one of the initiators of the NAM Economic Forum which evolved into the G77 meeting of leaders of NAM. Through support received from Dr.Gamini Corea, as head of UNCTAD, he pressed for a fair price policy in global trade, the lack of which kept us poor while the rich countries got richer (lowering prices of our products while increasing theirs). NM recognized that the process of globalization introduced to Sri Lanka by the UNP Government of 1977 would lead to increasing exploitation of our economy. 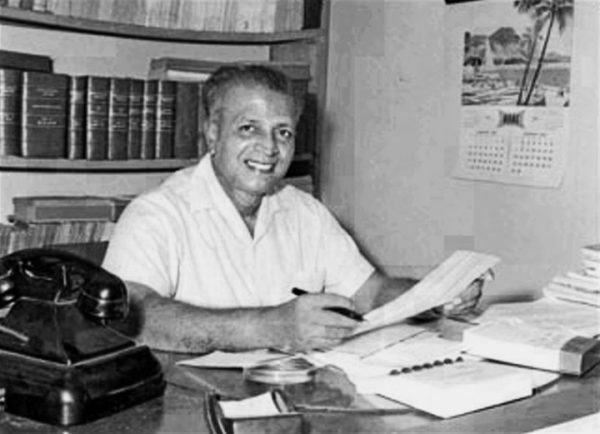 The UNP as the agent of global and local big capital wanted to reverse the progressive policies that the Centre-Left (SLFP/LSSP/CP) Coalition developed from 1970, to facilitate exploitation by the rich, cutting the welfare state, burdening the people. To implement UNP policies concentration of power in a civilian dictatorship headed by one person (J.R.Jayewardene), who could take decisions free from people’s pressure, was necessary. Thus without any participation by the public, the 1978 Constitution was hastily rushed through Parliament in the most undemocratic fashion. An Executive Presidency (with greater powers than in USA or France) was artificially grafted on to the (British) parliamentary model that had evolved in its own unique way in Sri Lanka since voting rights were given to all adults in 1931. NM led the protest by the LSSP and the Left against this undemocratic and harmful Constitution. In his “Critical Analysis of the New Constitution” he predicted what would happen. The situation of conflict between the executive president and parliament that would lead to conflicts was described, covering different sectors; increasing if the president was from one party and another party controlled parliament. The country would head to disaster. This has been borne out by the breakdown of governance, and of society itself, under the UNP/SLFP Government that took power in January 2015. The electoral system distances the voters from their MP’s. The large district-based electorates could be won only by those who had a huge sum of money, backed if possible by (underworld) power. As JR had their letters of resignation in his pocket the UNP MPs voted for JR’s Constitution despite it devaluing parliament. It is sad that after two and a half years of the present Government, these features remain in the Constitution, without significant progress to solve the national question. The current emphasis on accountability rather than reconciliation, and the promotion of religious and racial tensions, makes one wonder whether history is going to repeat itself under this UNP Government too (like the racial conflict and war led by the LTTE). Dr.N.M. Perera and the LSSP, when it was the second largest party, sacrificed its voter base by standing up for both Sinhala and Tamil as official languages. I would like to stress that the LSSP continues to oppose racial, religious, caste, gender and class discrimination, and supports the elimination of the executive presidency, a more democratic mixed electoral system based on small electorates, and an effective solution to the national question. NM predicted that the periodic crises of global capitalism would become chronic and that the big capitalist powers would be forced to resort to greater exploitation to maintain their control of the world economy. He called for reform of the IMF, World Bank and WTO (GATT) to protect the weaker nations. The proposal to replace the dollar as the reserve currency by SDR was supported by NM. It is sad to see the UNP/ SLFP Government taking an IMF loan of 1,500 million US dollars over three years at 6% interest, binding our country to adopt the disastrous neo-liberal policies that led to the recent tragedy in the Greek economy. The economic hardships that the people of our country face today are the consequence. I opposed this action from the time it was announced over a year ago, but I received no media coverage. In contrast the Chinese Asian Infrastructure Development Bank has given Government 1,000 million US dollars at 2% interest, and we could get more, without any conditions, and dispense with the IMF loan. Loss of our Independence and Sovereignty. The saddest and most dangerous part of what is happening to our country is the military agreements to give the US 7th Fleet use of Trincomalee as a naval base, and the incorporation of Sri Lanka into the military machine of the USA to patrol the Indian Ocean. This is at our expense (the UNP/SLFP Government spent US dollars 400 million for fighter jet planes and US dollars 300 million for new armaments). We are losing our national independence and sovereignty in the process. The present BJP Indian Government also has military agreements with the USA and is a party to these moves, but certain progressive political activists and commentators in Sri Lanka highlight the lesser Indian role, without highlighting the US military, financial and industrial complex that is behind what is happening in Sri Lanka. My references to this important threat also received scant media attention. A leading US war correspondent, John Pilger, mentions that besides an economic attack on China, the US is preparing for a military attack. Thus Sri Lanka could get caught up in a global military conflict. It is sad to see in this esteemed newspaper a self-appointed “Marxist pundit”, Kumar David, who was a party to the current betrayal of NM’s Marxist policies ( refer Ashoka Mehta’s Hindu article, quoted by the Lankadipa of 1/02/2015), pontificating to the LSSP and the Marxist Left. Heproposes uniting with non-Marxist, opportunist, foreign funded and manipulated, so-called “left” parties, like the JVP, to form a left consolidation that could attract progressive masses in the name of “neo-populism” (repeated ad nauseum). He fails to see that the progressive populist masses have already rallied behind Mahinda Rajapakse and the Joint Opposition (JO). The JO May Day drew a crowd of several hundreds of thousand people to more than fill Galle Face, though the JVP, the richest party in Sri Lanka, could only bring amere 12,000 to its BRC meeting. This joker, who shifted from the LSSP to a variety of parties with a Marxist label and no following, and who has served the UNP and its US led imperialist backers, besides “preaching” to us, is crazy enough to offer “advice” to Britain, France and even the USA. Instead of making false statements like “the trade unions supported Le Pen” in France (for his information the majority of workers abstained or voted for Malanchon), he should at least respect the truth as a newspaper columnist, while he betrays Marxism in the name of Marxism. NM laid the foundation for our country to avoid these grave dangers and develop on humane lines as one independent sovereign Sri Lankan nation. With the JO we must tap the emerging massive populist wave, infusing NMs policies suitably modified to meet today’s needs, and become a truly developed nation without poverty. The anti-imperialist, anti-neoliberal struggle must be steadfastly continued. In NMs name, undaunted, the LSSP shall continue on such a path. « Jaffna Could Become a Semi-desert in the next 50 years due to Global Warming Warns Cabinet Minister Champika Ranawaka.